This part of the Python Bookshelf tutorial shows how the sample app stores its persistent data in Google Cloud SQL. When deployed, your app uses the Cloud SQL Proxy that is built in to the App Engine environment to communicate with your Cloud SQL instance. However, to test your app locally, you must install and use a local copy of the Cloud SQL Proxy in your development environment. To perform basic admin tasks on your Cloud SQL instance, you can use the MySQL client. Note: You must authenticate gcloud to use the proxy to connect from your local machine. Now use the Cloud SDK to run the following command where [YOUR_INSTANCE_NAME] represents the name of your Cloud SQL instance. Make a note of the value shown for connectionName for the next step. This step establishes a connection from your local computer to your Cloud SQL instance for local testing purposes. Keep the Cloud SQL Proxy running the entire time you test your app locally. Set the value of DATA_BACKEND to cloudsql. Set the value of CLOUDSQL_USER, CLOUDSQL_PASSWORD, and CLOUDSQL_DATABASE to the values you used when configuring the Cloud SQL instance. For simplicity, you can use the root user and root password configured while creating your instance. Set the value of CLOUDSQL_CONNECTION_NAME to the connection name for your Cloud SQL instance. This should be visible in the Google Cloud Platform Console in the details for your Cloud SQL instance. It should be in the format project:region:cloudsql-instance. The application stores all persistent data in Cloud SQL. 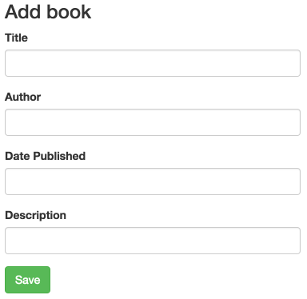 When a user clicks Add Book, the crud.add view displays the form. After the form is filled in and the user clicks Save, the same add function handles the form's HTTP POST action and starts the process of sending the submitted data to the Cloud SQL database by passing it to the model.create function. The bookshelf/model_cloudsql.py file contains the code that performs CRUD functions for data stored in the Cloud SQL database. The SQL is created using an Object Relational Mapper (ORM) called SQLAlchemy. Object relational mappers make it possible to interact with your data models as Python objects and have the equivalent SQL generated for you. Another popular ORM you might have worked with is the Django ORM. To simplify integration with Flask, use the Flask extension Flask-SQLAlchemy. For example, the create statement in the preceding code calls the create function in model_cloudsql.py, which then updates the data model by converting the attributes passed in as a Python dict into keyword arguments for the Book constructor. It then adds the model to the database session and commits the session. SQLAlchemy converts this to a SQL INSERT operation and creates a new book entry in the database. When a user edits a book's information after it has been submitted, the update function in model_cloudsql.py is called, which queries for the existing entry by its id field. Then it iterates through the updated fields and edits them in the existing model. Finally, the function commits the session, and in this case, SQLAlchemy converts the edit to a model as a SQL UPDATE operation. After users have added books, clicking the Books link navigates to the /books page, which lists all the books currently stored in the Cloud SQL database. The list function does the work of listing all the books by using data retrieved from the Cloud SQL database. Here you can see how Python object methods can be converted to the appropriate SQL. In the preceding code, the limit method specifies the number of records to return from a database, which in turn adds a LIMIT clause to the SELECT SQL statement generated by the query. The offset method adds an OFFSET clause to the SELECT statement, which allows you to specify a starting point for handling pagination and allows additional pages to be requested based on the value of cursor.